Sap — When hash oil is stringy and sappy rather than shattery. Sativa — Sativa varieties originate mostly in the equatorial areas of the world and are known for their uplifting, heady effects. The most popular near-pure sativa variety in modern cannabis is Haze, but Durban Poison is another very popular sativa line. The plants grow very tall and take a long time to mature, but the resulting yields are normally far greater than traditional indica plants. Sativas are best known for treating depression, fatigue, and promoting creativity and sociability; they can also mitigate the effects of glaucoma and certain nerve conditions, though their effects can definitely vary from user to user. Caution is generally advised for those who suffer from anxiety and fibromyalgia, as these conditions can often be aggravated by a racy sativa. Schwag — Low-quality weed heavy with seeds and stems (also ditch weed, Mexican brick weed, etc.) — An insulting word for the worst kind of pot, bags of schwag must be thoroughly cleaned of stems and seeds before it should be smoked. Compared to high-end cannabis, it has little flavor or scent and is sparsely covered with trichomes. Schwag is typically consumed in large amounts in order to get you high, typically in a blunt. Because schwag is typically imported into the U.S., it’s flattened into bricks and is much harder than connoisseur quality. Most pot snobs consider schwag an insult and won’t smoke it, even in a pinch. Seedling — The earliest stage of a cannabis plant’s life, when it first emerges from its seed and rises above the soil. Seedlings are different from small clones because they are by definition produced from seed, not asexually. Sensimilla — From the Spanish meaning “without seed,” this term has mostly fallen out of use in the modern day, but refers to the top grade of cannabis which has no seeds, as opposed to seeded schwag or mids. Sesh — Short for a smoking session, a sesh usually involves smoking a good deal of cannabis with a few friends. Sharing a pinner joint with five people would be a fairly weak sesh. Shatter — (see also: butane hash oil) Shatter is a texture of hash oil and refers to the transparent, shelf-stable oil which breaks into pieces rather than bending. The most popular choices of butane concentrates on the market are either shatter or wax, which are on opposite ends of the spectrum when it comes to texture. Shotgunning — The act of turning a blunt or joint around and placing the lit end in your mouth, then blowing out to create a stream of smoke from the other end that can be inhaled by a second party (or French inhaled through the blowers nose). A shotgun can be administered by holding hands to create a chamber, over a surface like a book or cowboy hat, or just by placing the recepient’s mouth an inch or so from the end. Skunk — This term can refer to either particularly pungent cannabis (which often has a skunky quality to it) or to the specific strain of cannabis which is one of the building blocks of modern cannabis breeding. Popularized by Sam the Skunkman, the original Skunk #1 was reportedly made in California from Acapulco Gold, Colombian Gold and Afghani genetic lines, resulting in a sativa-dominant hybrid that was still capable of finishing outdoors in the Netherlands’ short growing season. Skunk #1 has been bred into probably 50% of the gene pool over the last 20 years due to its high commercial potential and its prevalence in the Dutch scene, which was responsible for the majority of seeds that have been sold and grown worldwide. Ask the Cannabist: A reader wonders what happened to the “heirloom” strains, like Panama Red and Colombian Gold. Why are they so hard to find? 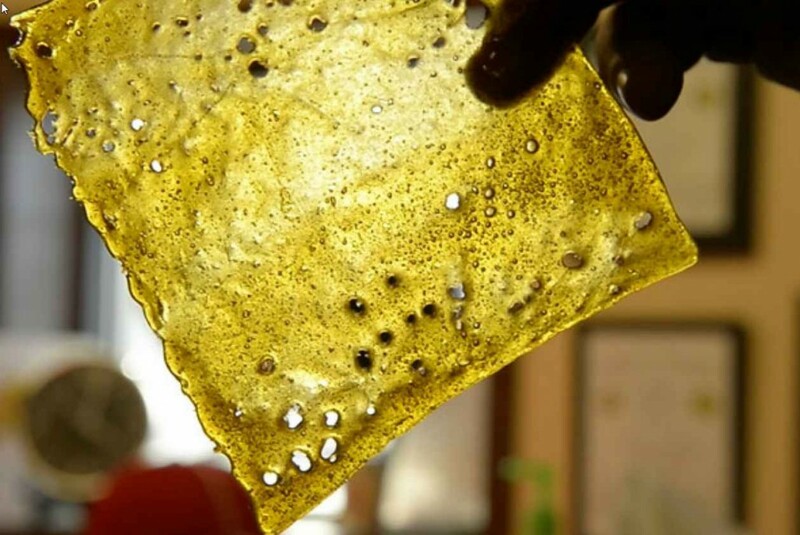 Slab — A large amount of hash oil, which lays out flat into a golden slab. Smurfing — Originally referring to the common practice with methamphetamine manufacturers where they send a crew of individuals into pharmacies to purchase the now-controlled pseudoephedrine products which are required for production, this term has also been applied to the practice of people jumping from dispensary to dispensary, buying as much cannabis as they can in order to re-sell it on the black market. Solventless wax — Coined originally by internet cannabis personality and Colorado resident Paul Tokin, solventless wax (or sometimes solventless oil) refers to the highest grade of water hash, which looks and smokes similar to solvent-based hashes and is capable of being dabbed. The originator of the product is Colorado-based hashmaker Selecta Nikka T, who has won multiple cannabis cups for his products over the last 4 years. Spliff — A combination of tobacco and marijuana rolled together, often in Europe, that can at times be a cone shape. It’s a great way to let people know you’re cool enough to have backpacked in another country and got high with some people who spoke another language. It can add a nicotine buzz to your high, but people who don’t smoke might find it super offensive, so it can be great if you don’t like to share. Stoner — Typically a derogative term, a stoner is someone who loves getting high, no matter what time of day. Often, they’re a part of a subculture that identifies with marijuana smoking and may be forgetful or slow at times. Some use the term as a source of pride, like CelebStoner.com, and can be reverential. Someone who casually smokes marijuana occasionally, on the other hand, would not be considered a stoner by actual stoners. Supercritical extractions — When a substance is heated and pressurized beyond its critical point, it turns into a supercritical fluid capable of working as a solvent to strip away oils and essential compounds. It is used in a variety of industries for botanical extractions with several different types of fluid, but in the cannabis world, it generally refers to CO2 extractions. Supercritical extraction by nature is not particularly selective in terms of what it extracts, so many CO2 processors need to utilize a secondary solvent such as ethanol or hexane in order to remove waxes and chlorophyll prior to delivering a finished product.